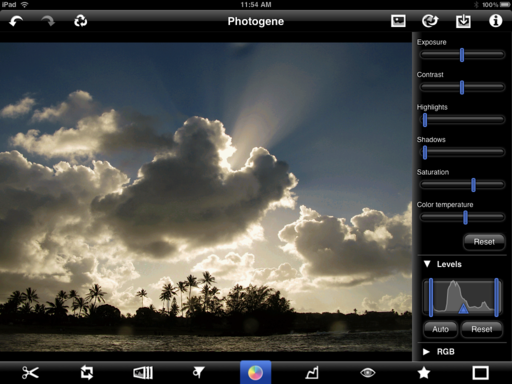 Not all photo software has to cost you an arm and a shoulder strap. There are some excellent utilities that will set you back less than $5, or even free. And they are useful for the seasoned pro as well as the casual snapshooter. 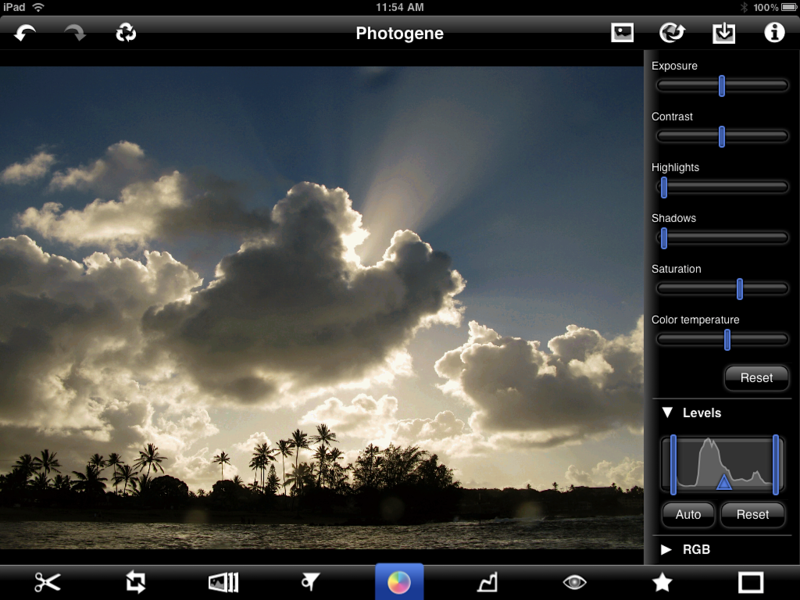 This week I look at Preview for Mac OS X, and Photogene for iPad and Filterstorm, also for the iPad. Preview is free (included in Mac OS X), and the two iPad apps cost $3.99 each. Preview for Mac OS X is free, but includes some surprisingly robust editing tools. Click on image for larger size. What's so amazing is how good all three are. 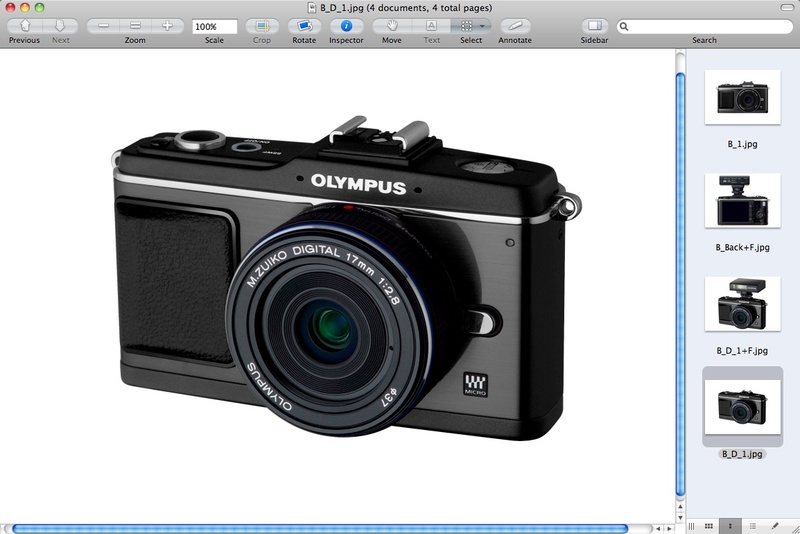 Many Mac users know Preview for PDF reading, but don't realize there is a robust set of image editing tools there also. Meanwhile, on the iPad you have surprising pixel pushing power to create a very portable workflow. I spend the most time this week on Preview, but do cover the other apps too. I think you'll be surprised by what you learn. Saturation is the September 2010 Photo Assignment. You can read more about how to submit on our Member Participation page. Deadline for entry is Sept. 30, 2010. 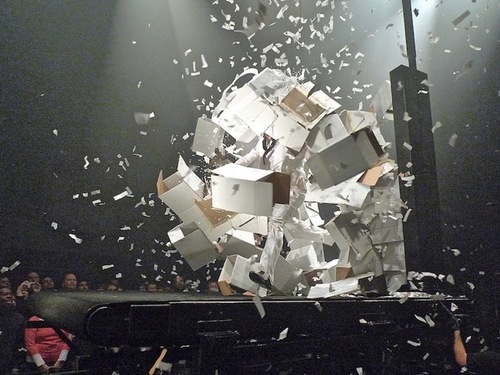 Here's a collection of images to create shear delight. The assignment for July 2010 was "Torn." Check out this edgy set of images from members of the TDS virtual camera club. And which one will be the SizzlPix Pick of the Month? The September 2010 assignment is "Saturated." Start working on your contribution now. Details can be found on the Member Participation page. You can now submit photo assignment pictures up to 800 pixels in the widest direction. Please follow the instructions carefully for labeling the subject line of the email for your submission. It's easy to lose these in the pile of mail if not labeled correctly. For example, the subject line for next month's assignment should be: "Photo Assignment: Sept. 2010." Also, if you can, please don't strip out the metadata. And feel free to add any IPTC data you wish (These fields in particular: Caption, Credit, Copyright, Byline), I use that for the caption info. Photo by Robert Yanal. (Click on it to see enlarged version.) You can read more about how Robert captured this shot, plus see all of the other great images on the July 2010 Gallery page. Good luck with your September assignment, and congratulations to all of the fine contributors for July. Once again, it's a great collection of images. Music and audio add presence to our slideshows and movies. The combination of ambient sound, such as waves lapping up on a beach, and a soundtrack, such as a guitar solo, transforms our pictures into experiences. Aperture provides two methods for managing these audio tracks, and I want to review them quickly so you can take full advantage of what this application offers for movie making. Two types of soundtracks: Top -- "Secondary Audio Track," which is editable, and Bottom -- Main Audio Track, which has other advantages. There are two types of audio tracks for Aperture multimedia presentations: Main Audio Track, and the Secondary Audio Track. Each has their advantages, and I often use them together in my presentations. The Main Audio Track is the simplest to use. Click on the "Display Audio Browser" icon in the Aperture interface (music note image) and select a song from your iTunes library. 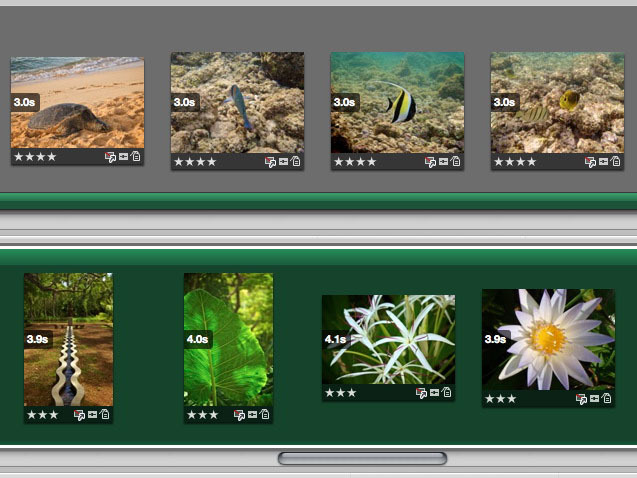 Drag it to the background of your slideshow timeline, and it converts to green (as shown in the bottom image). You can't edit this soundtrack, per se, but you can do two very important things: "Fit Slides to Main Audio Track," and "Align Slides to Beats." Both options are found in the gear popup menu on the toolbar. I particularly like "Align Slides to Beats." You can see that I used it in the illustration above. The slides range from 3.9 to 4.1 seconds as Aperture keeps your images and music in sync. Try it, I think you'll like the results. If your show goes longer than the song you chose for it, you can add a Secondary Audio Track. This time, when you drag the audio from the browser, drag it to the bottom of the particular slide where you want the track to begin, as show in the top illustration. Unfortunately you can't use "Align Slides to Beats" with secondary tracks, but you can control their length by clicking on the end of the track and dragging. With just a little fiddling around with these controls, you can raise the level of your presentation to professional heights. 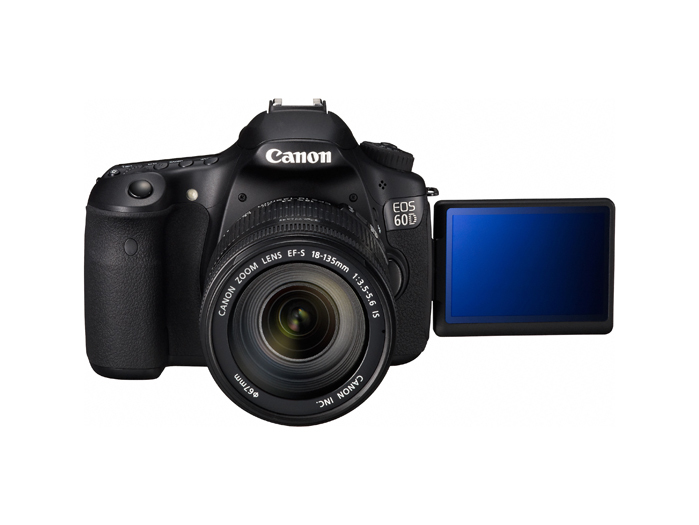 Is the Canon 60D Built for Video, or What? The minute I saw the "swing out" Vari-Angle 3-inch Clear View LCD screen with 1,040,000 dot/VGA resolution (plus anti-reflective and smudge-resistant coatings), I knew the new Canon 60D was built for video recording as much as stills. Speaking of movie making, the EOS 60D features Full HD video capture at 1920 x 1080 resolution with selectable frame rates of 24p, 25p or 30p. Plus, according to the Canon press release, "The Canon EOS 60D allows for three video recording modes - Full HD and HD in a 16:9 aspect ratio and Standard Definition (SD) in a 4:3 aspect ratio, all at selectable frame rates. The EOS 60D Digital SLR camera will record Full HD at 1920 x 1080 pixels in selectable frame rates of 24p (23.976), 25p, or 30p (29.97); 720p HD recording at 50p or 60p (59.94) and SD video at frame rates of 50p or 60p (59.94). The EOS 60D features a dedicated button to initiate live view for both video and still shooting. Once engaged, the same dedicated button will start and stop video recording." The feature that I didn't see in the press release, but one that I'm sure is there, is an external mic jack. Without that, the rest really doesn't make a difference. The 60D has some other cool stuff, such as a built in Speedlite transmitter. But I'll save that for when I can get more details. 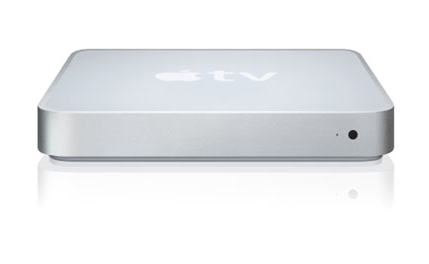 Is it Time to Dust Off my Apple TV? There are so many things about my Apple TV that I like. Why is it that I don't use it more? I have a Flickr account, and my images look great on HDTV thanks to the little white box. It's fun surfing YouTube and discovering something unexpected. I've listened to music, watched TV shows, and have even rented movies using the Apple TV. All stuff that I can do with my MacBook Pro or the iPad. And I think that's the problem for me with Apple TV. It doesn't do that one unique thing better than my other devices. The iPhone fits in my pocket and makes phone calls. The iPad fits in my messenger bag and does... well, just about everything. And my MacBook Pro has the horsepower I need to run Aperture and Photoshop. I need all of those functions. So my Apple TV just sits there most of the time looking adorable beneath the HDTV. Maybe on Sept. 7, Steve will give me a compelling reason to dust it off and bring it into my daily life. I sure hope so. I like the little guy. "Sunglasses ND Filter" I needed to slow down the shutter to shoot a waterfall in Kauai. 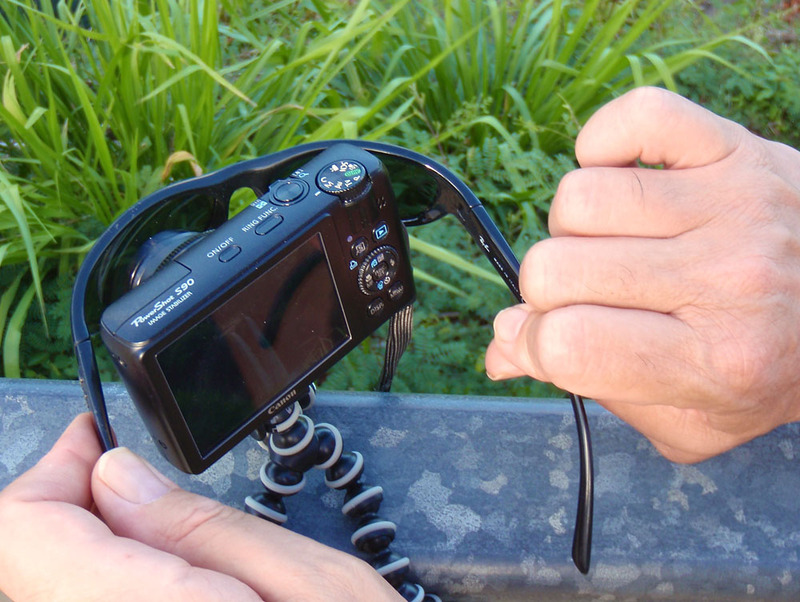 I mounted a Canon S90 on a GorillaPod and used my Ray Bans as an ND filter. When you're on vacation and taking pictures in a beautiful place, is it really a "workflow" when you move your pictures from camera to some sort of computer and look at them? What if you're having fun? When it's purely for your enjoyment, could it be called "playflow" instead? This week I explore a new "playflow" while in Kauai. Instead of bringing a laptop, I took only an iPad. I didn't bring all of my lenses. And in fact, I snapped most of the week's shots with a compact camera. Yet, I was able to review the images, upload to Flickr, post to TDS, and even check my email now and then... but mostly then. So this week's episode is dedicated to the art of taking a little time off to enjoy family and nature, but still enjoying photography. Tandem is the August 2010 Photo Assignment. You can read more about how to submit on our Member Participation page. Deadline for entry is Aug. 30, 2010. I did it. I got on a plane and flew far away leaving my laptop at home. For eight days I was totally laptopless. Instead, I had a 3G iPad with a Camera Connection Kit. A week later, I had shot more than 600 photos, posted to Flickr, and managed to refresh the blog. And truth be told, I never felt better. Editing a photo on the iPad using Photogene. Great for Flying. TSA does not consider an iPad a computer. 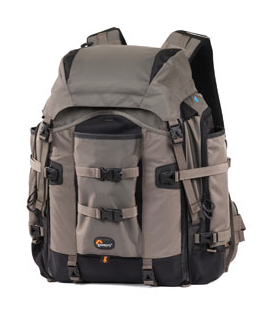 So you don't have to take it out of your backpack when going through airport security. Sweet. Plus, once I'm on the plane, I can actually use the iPad, even in economy seating. Less Weight. My MacBook Pro weighs over 6 pounds. The iPad is tips the scale at 1.5. Easier Internet. The hotel wanted $15 a night for an Internet cable. Plus, I'd still have to bring my AirPort Express to create a WiFi network. I said no to both. I used my 3G connectivity with no drama. It costs me $15 a month for 250 MBs of data. I used 170 MBs during the week at the hotel. In other words, one week of Internet for the price of one day. No Unnecessary Accessories. I used the Camera Connection Kit, power adapter, and two cords. That was it. Their total weight is less than the power adapter for the MacBook Pro. Great Software. For photo editing, I tapped the power of Photogene and TiltShiftGen. Wonderful. For navigation, Maps works great. Plus, the iPad is so light you can take it anywhere, yet has GPS and Internet connectivity. I never had a problem finding where I wanted to go or how to get there. So if the main goal of your trip is to have fun, and not work, then I highly recommend the iPad. Together, we had a great time. Aperture 3's slideshow authoring tool allows photographers to mix stills and video to create dynamic presentations. You can playback at full screen in Aperture to share with clients, friends, and family. Typically, however, we need to move those presentations off our computer to other devices, such as an iPad, or to YouTube and other online sharing sites. Maintaining that high quality during the export process can be tricky. And if you're not mindful, you might be disappointed with the results. The Export dialog box in Aperture 3. You can go with one of these presets, but you may not like the final output. In Slideshow mode, when you click the Export button in the upper right corner of the Aperture interface, Apple provides you with a handful of presets for various devices such at the iPod, iPhone, Apple TV, YouTube, 720p, 1080p, and Custom. The first thing iPad users will notice is there's no preset for them. You might be tempted to choose the 720p preset, but unfortunately that preset doesn't work on the iPad. iTunes won't let you copy the movie to the iPad. Plus you're stuck with 30 fps for your frame rate, witch is a bummer if you captured your video in beautiful 24 fps. You could go to the next preset up, "MobileMe/YouTube" for standard definition output (640x360 at 30 fps). But I can tell you right now, you probably won't like the results on an iPad, or even YouTube for that matter. The audio will sound fine, but my images were consistently soft. Create higher quality previews. Since I do use some Ken Burns effect in my shows, I decided that my default 1920x1920 previews might be compromising quality. Aperture uses your previews to create its slideshows. So I changed the Photo Preview (Preferences > Previews) to 2560x2560 at 9 quality. I then had to regenerate those previews at the new settings so Aperture could use them. I selected all of the thumbnails in my presentation, held down the Option key, and chose Photos > Generate Preview. This took a while for Aperture to regenerate the higher quality previews, so I took a break while the computer churned away. Export Using the Custom Setting. My goal was to create a high quality master file at the frame rate I wanted. To do that, I needed to select Custom under the preset menu. I used H.264, 24 fps (to match the video in my presentation) at 1920x1080. Label this file "master" for both playback on your computer, but also for creating smaller versions for other devices. Now Create Your iPad Version Using QuickTime 7. QuickTime 7 is in your Utilities folder. 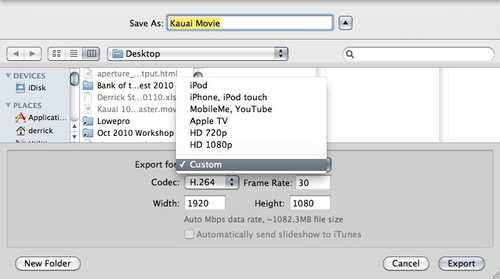 It gives you more flexibility for exporting than the QuickTime Player that is the default for Snow Leopard. 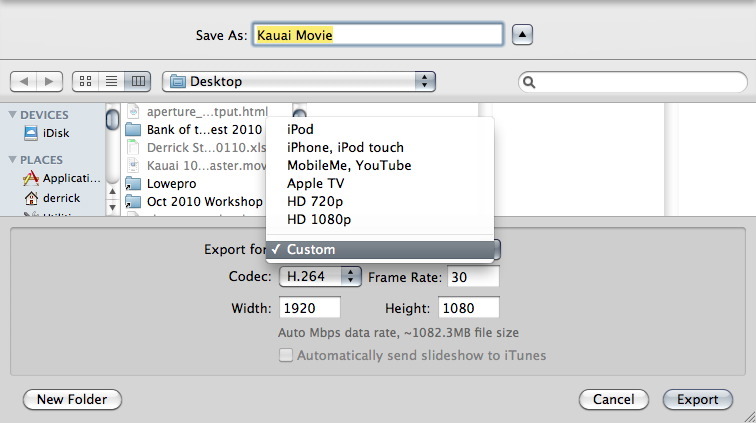 After the movie is open, go to File > Export and choose Movie to QuickTime Movie from the popup menu. Click the Options button and make these selections -- Compression: H.264, Quality: High, Frame Rate: (your choice, I use 24 fps), Encoding Mode: Multi-Pass, Dimensions: 640x480 (or what ever you want), and Scale: Letterbox. For Sound, just make sure you go with AAC at whatever settings you want. All of these steps take time to process, so make sure you have other tasks lined up to do elsewhere. Once your new movie is rendered, copy it to iTunes or upload to its online destination. On my iPad, I have both versions of the same movie: the Aperture preset for "MobileMe" and my multi-step version. The quality of my version is about twice as good. After just having spent a week in Kauai with a Canon S90 in my pocket, I can tell you that this compact is a godsend on the road. The ability to shoot with a fast f/2 lens in low light and save the images in Raw means that I rarely miss a photo opportunity. 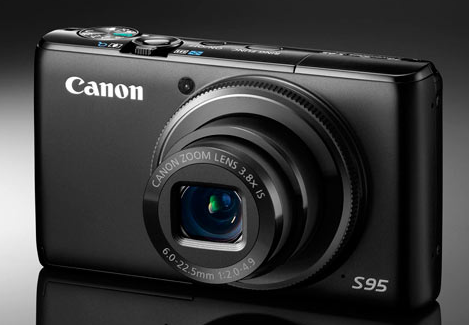 Now, with the just-announced Canon S95, a great camera gets even better. Canon has added HD 720p 24 fps video, click stops on the back control dial, improved stabilization, enhanced front control ring, and a high dynamic range mode. These improvements address just about every nit I had with the S90. It's an upgrade that I'm going to get as soon as I can.